Friday is always such a joyful day. The feeling can be traced all the way back to my school days. After five long days of seemingly endless learning, assignments, & homework, Friday was always a momentous moment — an achievement. Instead of school, now it's social media & blogging, but the idea is the same. Friday is the mark of an accomplishment. We did it! Happy Friday! 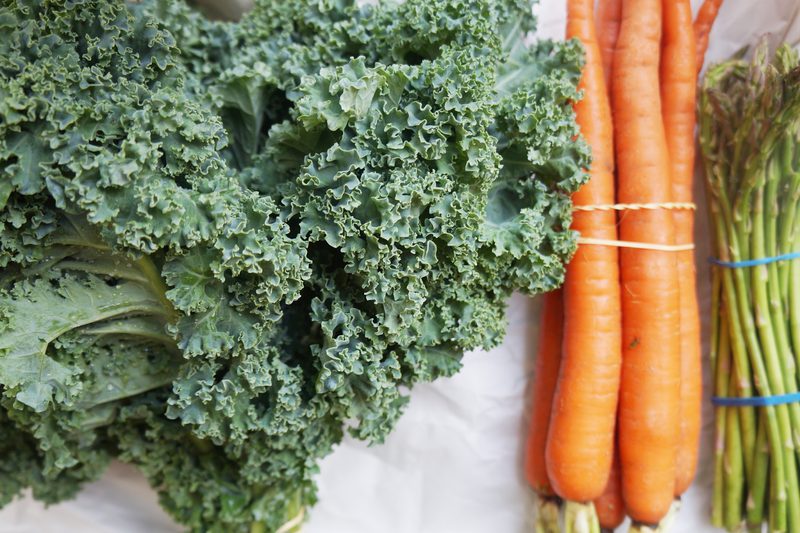 Here are the five things I'm loving right now — farmers market edition! Well it's officially autumn. Hooray! This is my favorite season in California. Since it's fall, I obviously had to buy some mini pumpkins to add a touch of festivity to the house. I got two of these pretty white pumpkins & two orange ones. What a yummy little treat. Thai tea is strongly brewed black tea, often spiced with cardamom, anise, etc. The brew is sweetened with sugar & condensed milk, making the most beautiful swirls as everything blends together. If you like masala chai, you may enjoy this too. I love me some herbs. I was at the farmers market & simply had to buy a dill plant (not pictured). Although I can't recall the exact price, it was incredibly affordable. I adore dill so much, so I couldn't survive without it any longer. 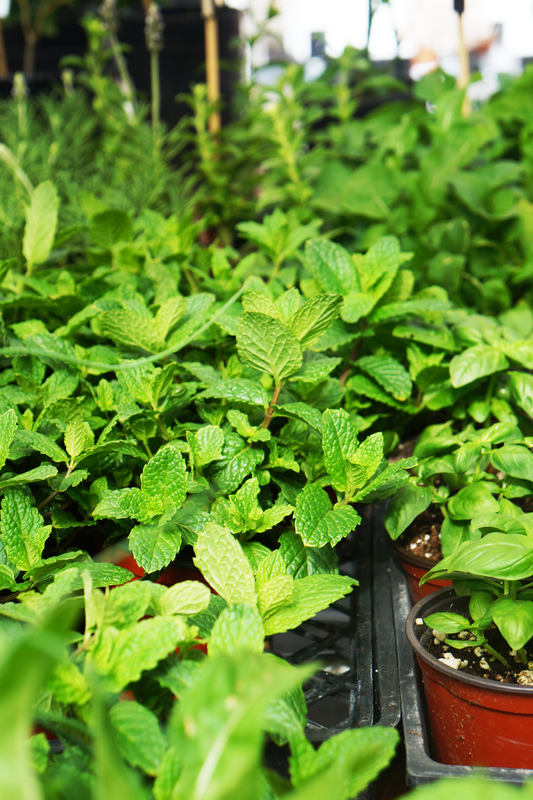 It's such a fragrant, approachable herb. I bought some veggies from the farmers market & vowed to purchase more of my produce from there. Everything was incredibly fresh, like the farmers had literally picked everything prior to coming to the market & immediately plopped it on the table. The kale even had a little caterpillar on it. That's fresh alright! 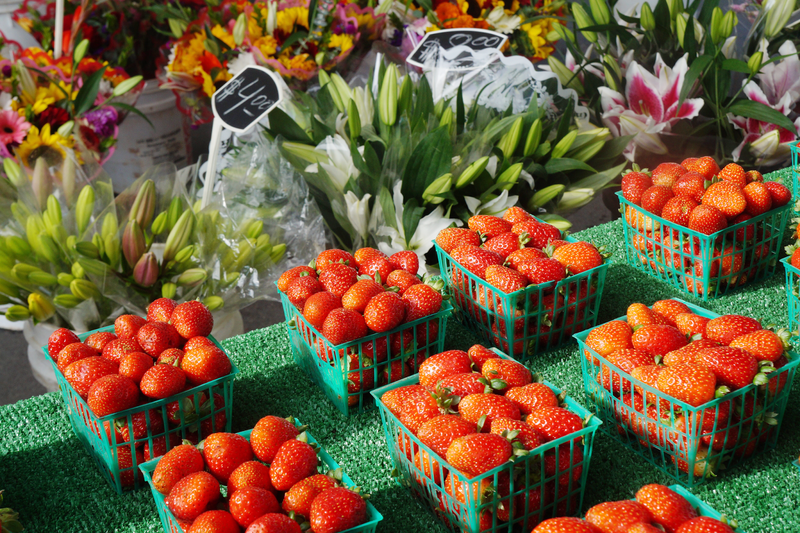 Flowers & fruit make for a remarkable combination, don't they? I swear these strawberries were redder & more sweet than anything I've had before. It was like eating pure sugar. I bought a bouquet of flowers for $5 too. Can't beat that price. Gorgeous photos! I think white pumpkins are so cute and make a perfect decor piece. I do not like fall or winter just for the reason that I hate cold weather, but I do love fall colors and fall fashion. Nice list. 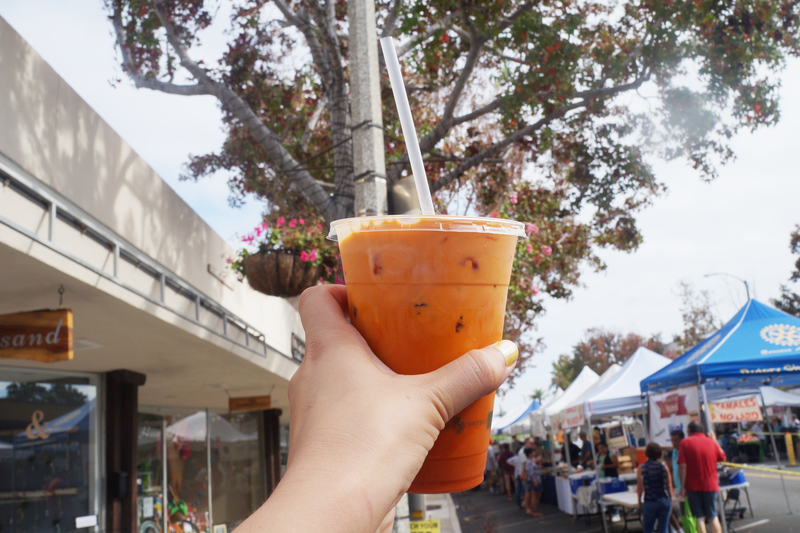 Yes I'm such a fan of thai tea as well and pumpkin time for Fall! Really enjoyed reading this! 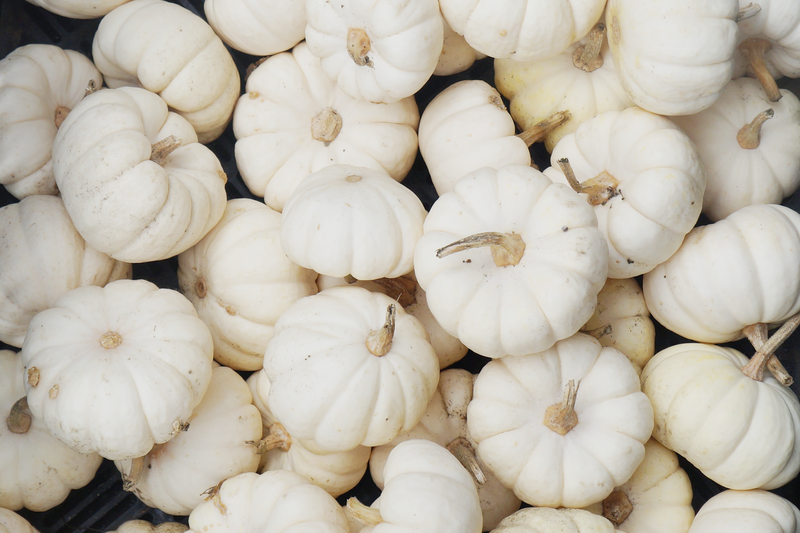 The white pumpkins are adorable - and so photogenic, too. Mind checking out my recent - it's a brand collab ft. floral bombers! I'm in love with fall. It's almost as joyful a time as spring for me. Pumpkin spice everything rules though! Thank you for writing this entertaining article. Amazing pictures, love this post!! Oh my gosh, I'm flipping out over this entire post just because the photos are making me so giddy and happy -- I've NEVER been to a Farmers' market and have never experienced autumn, so put those two together and it's me wanting to roll myself in a puddle of orange and never get up, hahaha. Have a lovely week ahead, Carmen! Such beautiful and fresh photos! :) I am loving the fact that there are so many fruits and vegetables available right now! My grandma sends me heaps of them from the countryside and I couldn't be happier about that! Hi Carmen! This Autumn we are determined to find a nice, comforting pumpkin soup recipe. That's quintessentially Autumn, right? Every fruit is extremely sweet out there. They are also so huge..
Hey, I'm Carmen. I quit my corporate job to become a full-time lifestyle blogger & social media/blogging coach. I'm here to provide you with interesting & relevant posts on travel, style, wellness, blogging, & entrepreneurial life. Welcome to my online oasis! Sign up for my blogging + social media newsletter! You'll receive exclusive tips straight to your inbox. © Carmen Varner // Lifestyle Blogger & Social Media + Blogging Coach • Theme by Maira G.